Rotorua has a lot to offer, something for all ages and tastes. The region is famous for its geo-thermal activity, Maori culture, great walks, world class mountain biking, thrilling jet boat rides, zorbing, ziplining and much more. Below are a selection of Luxury Adventures favourite Rotorua experiences. 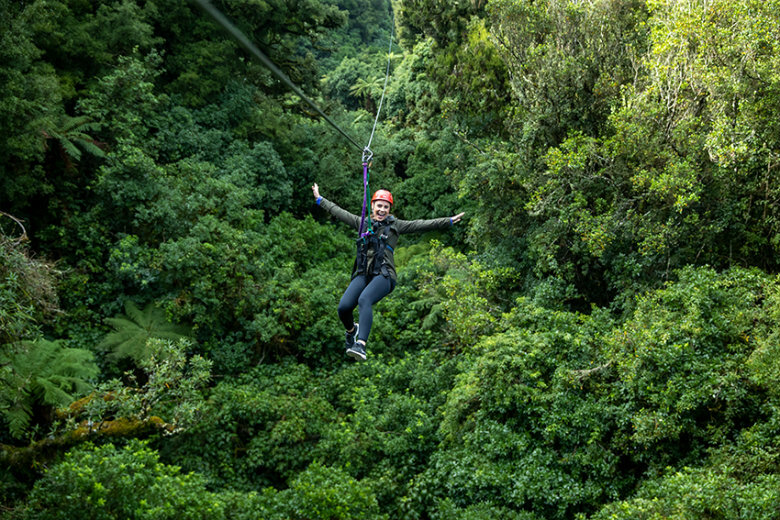 Tree Top Adventures: Get to experience Rotorua’s newest new Eco adventures with zip-lining, high above Rotorua’s lush green canopy, full of ancient trees, and native bird song. The zip-lining course stands deep within 500 hectares of protected conservation forests. The beginners course takes approximately 3 hours and travels 1.2 kilometres over various length zip-lines, as well as tree top platforms, and suspended bridges linking the trees. The passionate guides will guide you through the course and inform you of the history of the forest, how the course was built, and the bird life. The operators are passionate about the ecology and bird life in the area. Feel like more, step it up to the ultimate course, with a 400 meter zipline! Float Plane: Experience the romance and thrill of departing in a float plane from Rotorua’s lakefront pier, take in views of the Mount Tarawera, a volcano responsible for one of New Zealand’s largest historic eruptions in 1886 destroying several villages, including Te Wairoa (which is now known as a tourist attraction), the buried village, and the famous Pink and White terraces. 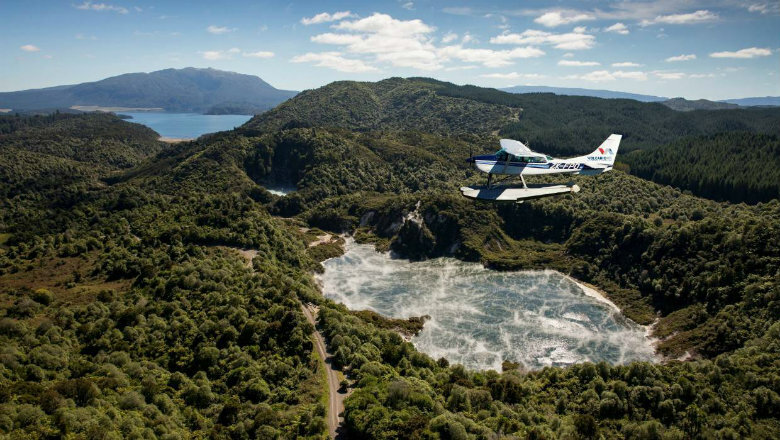 Fly over stunning lakes, mountain ranges, thermal valleys, with views of Wai-O-Tapu and the Champagne Pools, following the Waikato River to the hidden valley of Orakei Korako. Some tours can land on the on the river, and combine land based tours of the geothermal region of Rotorua. Or you can take an extended float plane flight and take in White Island, New Zealand’s only permanently live volcano. Talk to Luxury Adventures about including a float plane flight in your honeymoon or vacation. Rain forest & white water rafting: New Zealand is known for its lush green forest, picturesque landscapes, and adventure tourism, why not combine all of these and add in a rare and endangered birds informative narrative about the ecology of our rainforests from a passionate and experience local guide! 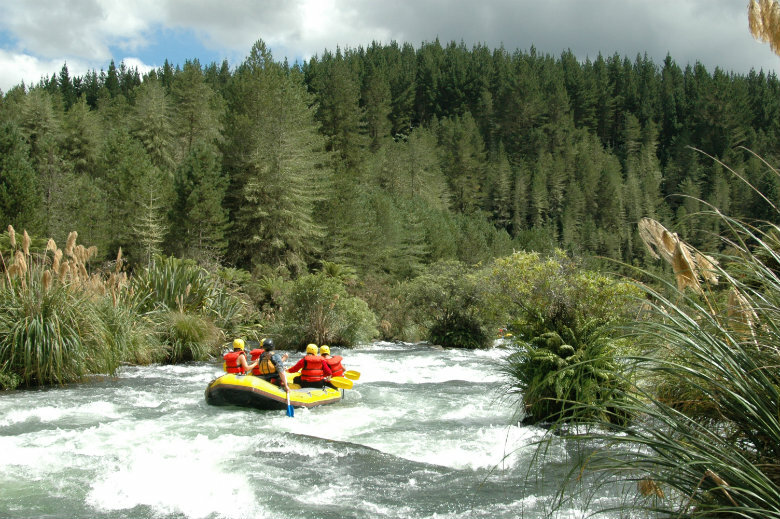 Luxury Adventures can arrange a full day Rotorua experience with a guide, combining a bush walk among massive 1,000-year old trees and rare birds, with a fun rafting trip on the beautiful Rangitaiki River. See Rotorua at its best! Mountain Biking: Rotorua is a mountain biking mecca, and is home to international events such as Crankworx. Whakarewarewa forest, also know as The Redwoods has an array of diverse tracks for all levels. The forest is easily accessible from Rotorua’s city centre, a short 5 minute drive, with over 70 trails (130km) there is a track to suit everyone from absolute beginners to pros. The tracks are well marked, and graded so its easy to pick a route that suits your capabilities. The park has bikes to hire and we can even arrange an expert guide to take you on the trails. 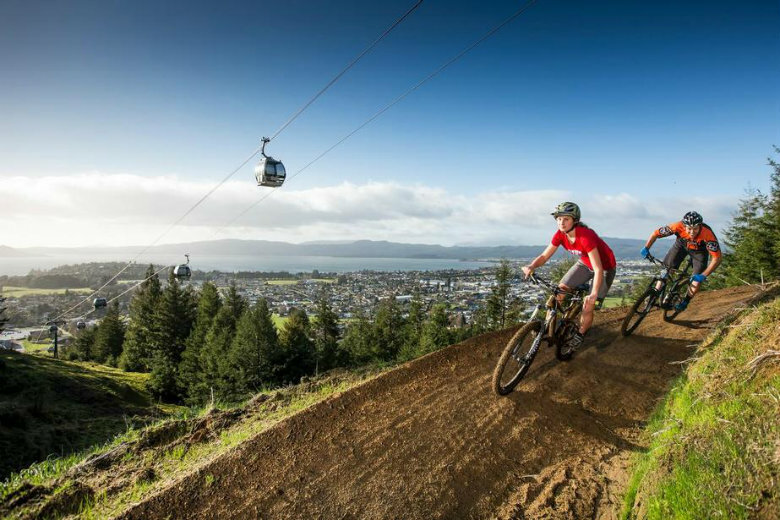 Rotorua is also home to world-class downhill mountain biking at the Skyline, with around 10km of easily accessible down hill tracks. Luxury Adventures Tony Townley is a keen mountain bike enthusiast, and is more than happy to discuss how to include some great rides into your itinerary. Futrher information can be found on our New Zealand mountain biking page.